Soil compaction is the real culprit of damaging your grass. When the top 4 inches of the soil become compressed, it will impede the movement of air, water and nutrients to the grass roots and make grass plants less able to compete with weeds. Then you should aerate lawn. The activity of earthworms and other thatch-decomposing organisms will be impaired in highly compacted soils with restricted oxygen levels. So compacted soil causes the accumulation of thatch. Then if you left unmanaged, thatch will lead to serious maintenance and pest problems. So frequent aeration is required to keep a healthy lawn. Aerating is the efficient solution to the compacted soil. What you should do is to remove cores of soil and leaving holes or cavities in the lawn and it is the core of aeration. Where you live, the type of grass growing and the weather are factors that affect the time for lawn aeration. Late August to mid September is the best time to aerate Kentucky bluegrass and other cool-season grass lawns. June and July are good months to aerate warm-season grasses such as zoysia, centipede, Bermuda, carpet and Kikuyu. 1. Aerating in either Spring or Autumn is the best time because damp conditions are best for de-thatching and aerating. Also, never aerate at the tail-end of the season, because you need enough time for the lawn to recover from the stress. 2. Before you aerate, you can test your soil to check whether it needs an aeration. Insert a screwdriver into the soil. If the screwdriver goes in relatively easily, then your soil is fine and has no need of aeration. If not, then your lawn may be in need of aeration. 3. Preparing your soil adequately before aerating is also important. First, you should mow the lawn. Second, clear any dead plants, fallen leaves, sticks and lawn cuttings. Third, If this has formed into a layer of thatch, you will need to remove it to make sure the air and water won’t be able to penetrate the soil. 4. Now, ready to aerate. First poke holes in the ground either by spiking the lawn with a metal rod or garden fork. Then push it into the soil to a depth of about 10cm and gently rock it back and forth. Repeat at 20cm spacings. 5. 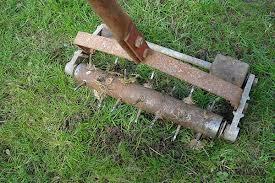 Evenly apply a thin layer of top dressing on a dry day after aerating so as to loosen the soil and improve drainage. Use a spade or shovel to put the top dressing on the lawn and then brush it out with a garden rake or broom. Overall, aerating the lawn helps it breathe better and ensures enough oxygen and water to your grass root. Also, it is able to store more water and tolerate drought better.